Q: Why buy a Prenup, I trust my intended? A: Modern life creates all kinds of responsibilities beyond the marriage that will be impacted by a separation or divorce. 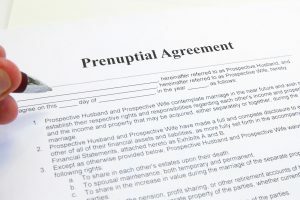 A prenup is ideal to seek to safeguard assets eg you have created over a long career before the marriage; Your parents or other generations have or will pass on to you; your children from earlier relationships. Remember, marriage is an emotional commitment that should acknowledge your past and future responsibilities outside of it. Q: When should I enter into a prenup? A: The agreement should be negotiated and signed up at latest a few weeks before your wedding day. Q: How do I make a prenup? Is it ok for us just write it ourselves? A: To have any chance of the Court in divorce accepting the terms of your agreement, certain guidelines must be followed. For further details, contact Stonehewer moss and arrange to see Michael Brennan or request an e mailed factsheet. In summary, you must be honest, fair and each represented by a suitably qualified lawyer. A: To advise, draft, negotiate and sign up a prenup Stonehewer Moss charge £1500 plus vat. Michael Brennan is accredited by the Law Society and Resolution as a specialist and works closely with specialised barristers to ensure the drafts used are as up to date with developments in the law as possible. Alternatively, you can visit our website at www.stonehewermoss.co.uk. This article was added on Tuesday, October 13th, 2015 at 12:13 pm and is categorised under Family Law, General News. Both comments and pings are currently closed. Error: Error validating access token: Session has expired on Saturday, 09-Mar-19 13:12:58 PST. The current time is Thursday, 25-Apr-19 05:57:28 PDT.